Kamala Khan’s team-up with Wolverine concludes this issue. Through interacting with him she learns a little more about what it means to help people and be a hero. As per the rest of this series, the tone is very light and very comical. The pages where she and Wolverine are battling a giant Alligator are nothing short of hilarious. Kamala is gaining a greater mastery over her abilities as she goes on but looks sort of silly doing so. I like how the artwork shifts to cartoonish facial expressions and it fits in perfectly. Kamala also learns something important through this fight; it’s stated by her that she doesn’t like hurting anything and ponders whether it’s possible to help people without doing any harm. According to Wolverine it isn’t possible and his life experiences have informed that but it doesn’t necessarily have to be true for Kamala, at least not at her naive stage of development as a hero. Wolverine rightly says that defending yourself from things or people that mean to harm invariably causes harm to them and there’s no escape from that. I imagine this will be an important lesson for Kamala that will inform her choices in the near future. Wolverine and Kamala’s conversations are fantastic, I really like how protective of her he already seems to feel. He even prevents herself from swearing in front of her to protect her from harsh language. It usually takes a lot for Wolverine to warm to a person the way he does here but they seem so natural together; my theory is that Wolverine feels vulnerable without his healing factor and seeks to protect others who are vulnerable. Despite her bravado Kamala is about as vulnerable as it gets especially since she doesn’t understand where her powers come from or how they work. She manages to have some light shed on them in this issue but she has a long way to go before understanding her origins and what they mean. I really like that Wolverine vouches for her which impresses Captain America who tells Medusa and causes her to arrange for her to be protected. Overall, a really excellent issue. 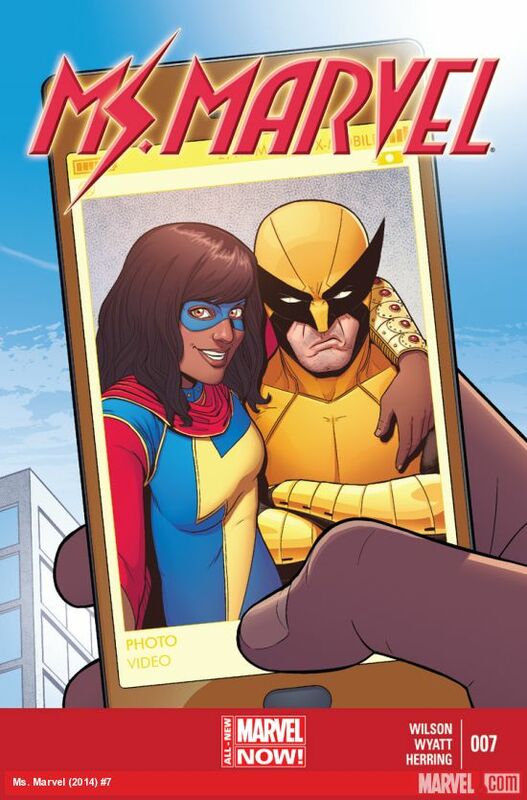 Wolverine and Kamala interact so naturally and there’s definitely a hint of a paternal relationship in there. Both characters are very stubborn yet vulnerable and alone at this point in their lives so it makes sense that they would feel some kind of kinship to one another. Wolverine passes on some sage advice to her and helps her learn more about her mysterious -to her- origins. This series continues to surprise and amaze with each new issue.